Sami al-Qouqa, a 30-year-old former fisherman from al-Shati refugee camp in northern Gaza, lost his left hand when his fishing boat came under fire from an Israeli gunboat on 12 March 2007, in an incident documented by the Palestinian Centre for Human Rights. “I was on my small fishing boat in Palestinian fishing waters when two Israeli warships approached me. The Israeli navy shouted at me: ‘Go back or we’ll kill you!’ Initially, I refused, so they began shooting at me. One of the gunboat’s shells hit me and seriously wounded my left forearm and hand,” al-Quoqa told IRIN. He was taken to al-Shifa hospital in Gaza City where doctors amputated his hand. He has since been unemployed and depends on the UN agency for Palestinian refugees (UNRWA) for food aid for his wife and two sons. Gaza fishermen say ever-tightening restrictions on where they can fish, frequent attacks by Israeli gunboats and an economic blockade in place since 2007 are putting more and more of them out of business. “Now, Israelis shoot all the time and without reason. The Israeli navy keeps confiscating fishing equipment and ripping up fishermen’s nets. We want a solution but we don’t know how or what or when. How long can this go on?” Muhamed Subuh al-Hissi, a member of the Palestinian fishermen’s trade union in Gaza, told IRIN. He said that before the 23-day Israel-Hamas war in Gaza around the beginning of 2009 Israeli gunboats only opened fire on fishermen who strayed beyond the three-mile buffer zone, but now boats were shot at well within the zone. Under the Oslo Accords, a peace agreement between the Palestinian Liberation Organization and Israel signed in 1993, fishermen in Gaza were legally allowed to venture out 20 nautical miles. However, since the start of the second `intifada’ in 2000, the Israeli navy imposed a three-mile fishing limit, and has enforced it rigourously since last year’s war, saying it was necessary to stop weapons being smuggled into Gaza. In early February Israeli Navy Commander Maj-Gen Eliezer Marom told reporters that Palestinian “terror organizations” were “making cynical use of Gaza’s fishermen for terror purposes” after the discovery on an Israeli beach of a third explosive device disguised as a barrel. He said any collaboration with the Palestinian militant groups who claimed responsibility for the launching of the barrels would harm fishermen’s livelihoods. 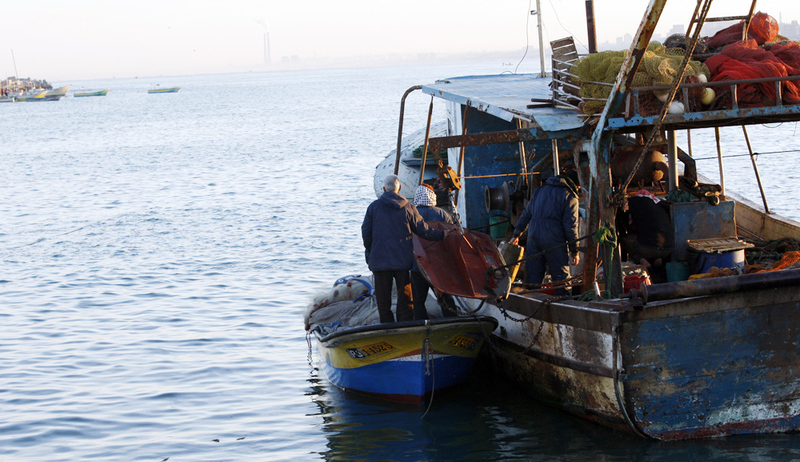 “Regular security ships guard the area, and allow Gaza’s fishermen to fish peacefully. I call on them not to cooperate with terror organizations and not to allow them to use these fishing boats for these purposes,” he said. According to the Palestinian Centre for Human Rights (PCHR), from 20 January to 2 December 2009, there were 36 Israeli naval attacks on Gaza fishermen while enforcing their buffer zone. Local witnesses said the latest incident was on 22 February, when Israeli gunboats fired on fishermen off the coast of Gaza, forcing them to return to shore. An Israeli military spokeswoman denied the shooting occurred. 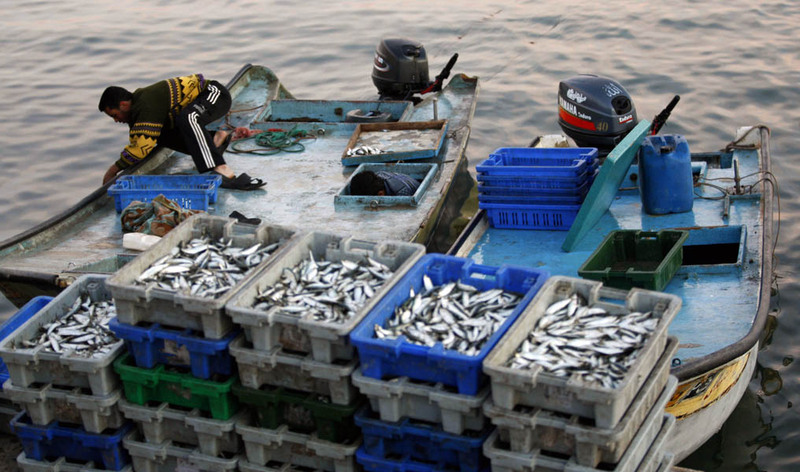 According to Gaza-based Palestinian think-tank PAL-Think,10 years ago there used to be about 6,000 fishermen in Gaza catching 3,000 tons of fish a year; now there are around 3,600 making such small catches that some have turned to opening fish farms on land. The Israeli blockade also prevents the export of fish out of Gaza, further hitting the livelihoods of fishermen. “As a result of the Israeli-imposed restrictions on the Gaza Strip, Palestinian fishermen cannot reach many points and cannot catch many fish… All the boats fish in the same areas, and there are no fish as a result in Gaza,” Hamas agriculture minister Mohamed Ramadan Agha told IRIN. He called on international organizations to take serious action to protect the livelihoods of Palestinian fishermen.